In 2005, when BSBO was renovating the little gray house on the edge of the Magee Marsh Wildlife Area for use as our headquarters, the Anna Macke Mikolajczyk family came to us with a very generous and moving offer. 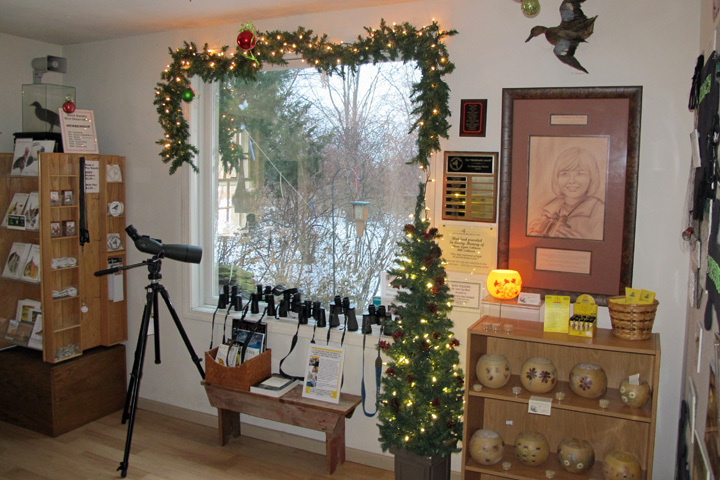 Anna, an avid birdwatcher in this area, had passed away not long before, and her family wished to honor her memory with a memorial in her name to be used to renovate the window on wildlife at the back of the building. With their generous gift, we were able to install a large window overlooking a feeding station and waterfall where the birds are a constant source of delight for our visitors! A wonderful sound system brings the sounds of nature indoors, and creates a wonderful, peaceful, delightful, and educational setting. Anna’s Window has brought the joy of discovery to so many lives! We have thoroughly enjoyed watching as our visitors make their way into Anna’s room, then waiting to hear the intake of breath, followed by the “oghs & aaghs” as they see the scene before them through her window. The BSBO staff have been richly rewarded, both through sharing those experiences with visitors, and our own appreciation of the wonders of nature that Anna’s Window delivers into our lives every day! She came here often-with binoculars, bird list, and field guide in tow-bringing friends along and making friends along the way. She traveled to points as remote as Antarctica in her quest to expand her life list; yet one of her favorite places was right here. To know Anna was to learn from her. Her vast knowledge and deep respect for all things natural were exceeded only by the delight she found in sharing them. Ovarian cancer claimed her life; it cannot claim her legacy. It lives on in the simple joys of those who come here to watch and listen, to wonder and learn. If Anna were here, she would have so much to teach you. But mostly, she would be glad you are here.